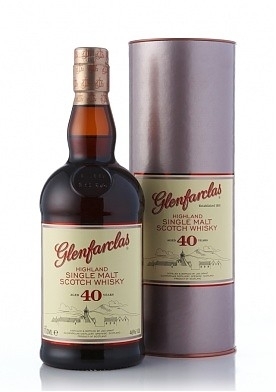 This is the rather fairly priced (when compared to other 40yo officials by other distillers) new wonder! Colour: dark amber with red hues. Nose: ultra-typical old sherried Glenfarclas, full of chocolate, raisins, prunes and then touches of mint, liquorice and varnish/pine resin. Also hints of blackcurrant buds, blackberry jam and finally a little coffee, smoked ham and toasted bread. Also a little walnut stain and maybe poppy seeds. In short, a classic. Mouth: excellent attack, with a flavourful oakiness (black pepper sauce alike) and various liqueur-filled chocolates. Chocolate-covered prunes. Goes on with fresh and clean notes of blood oranges, raspberry liqueur and just a few herbal notes that may hint at well-aged chartreuse. Hints of cough syrup. Finish: long, more on fruit skins and jams. Very pleasant fruity and resinous bitterness. Faint tannicity and liquorice in the aftertaste. Comments: I think it’s a good example of an old malt where an obvious oakiness brings more substance and complexity. Very well composed and worth its fair price, no doubt about that. SGP:562 - 91 points.